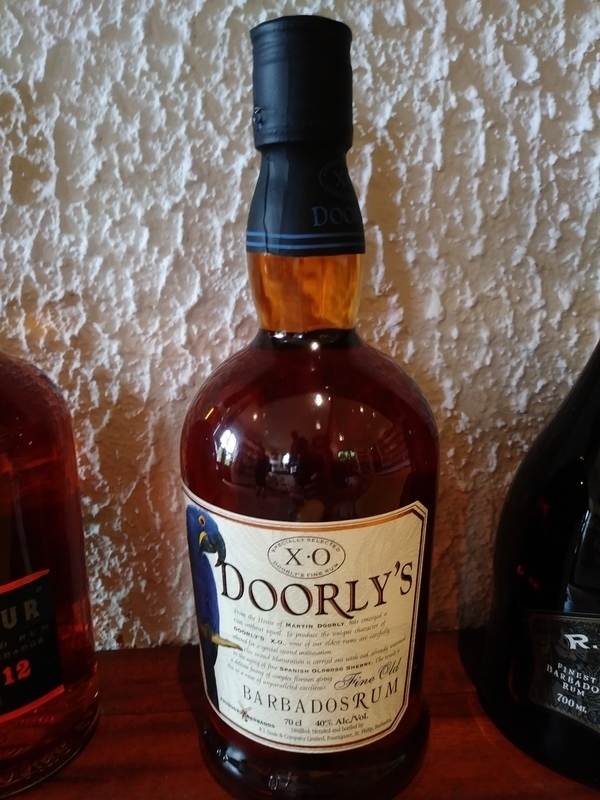 Have you found an online vendor selling Doorly's XO? 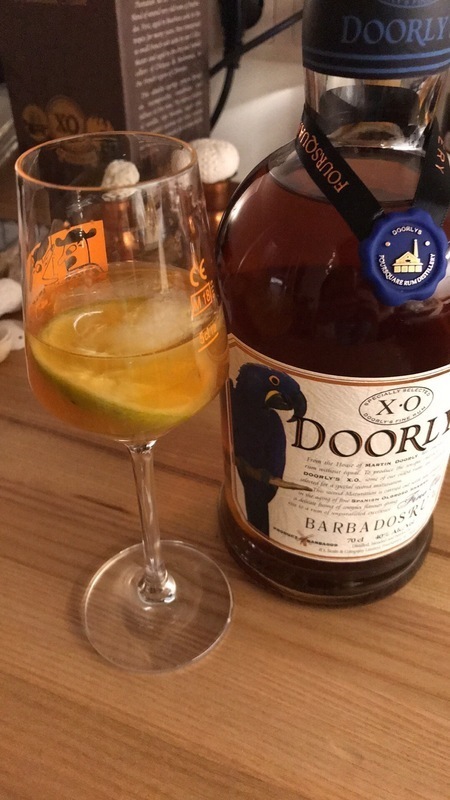 Produced in Barbados by master distiller Richard Seale, the rums in Doorly XO have been aged a minimum of 6 years before finishing in Olorosco sherry casks. The second maturation in sherry casks is rare and gives Doorly XO its unique flavour. Another great tasting and great value rum , It seems to me that the rums from Barbados are very natural with no extra sugar , caramel etc added . Its got a bit of a Sherry flavour to it in my opinion , not a great sipper but a magnificent mixer with a slice of lime and an ice cube. First a disclaimer, I'm not a big fan of sherry aged rums, it's just not my palate. But I find them a reasonable competitor of other dark, sweet rums and I prefer the sherry style over the sweeter styles because a dryer spirit fits my palate. But this is a fine rum by Doorly's. Bottle: I'm a bottle snob which is why I post bottle comments, I like the way some bottles look on the shelf. The art of appreciating something labeled "fine" is partly vanity act. I really like the Doorly's bottles, I just wish they were all synthetic cork style toppers, a screw top just doesn't do the end product justice. Bottle Aroma: Sherry and oak are at the nose immediately, then the rum comes along for the ride. Glass Aroma: Like a sherry, the spirit opens up and has a sherry dry but sweet nose, the rum pushing the smell out but is not that apparent. 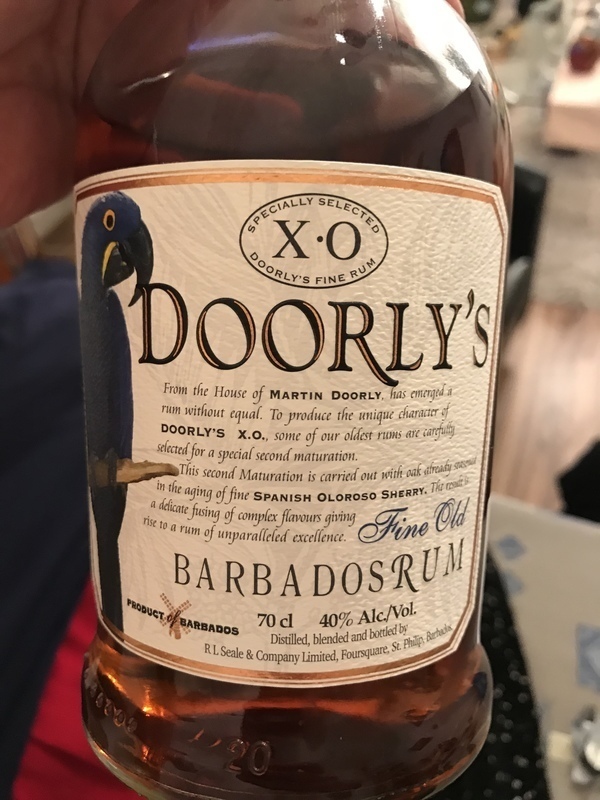 Taste: Rum and sherry really are a great mix and Doorly's XO does not disappoint. It is on the tongue where the rum comes through and tells you this is indeed not a sherry spirit. The heat is low all the way through to the throat. The drink is quite pleasant and is another example of a rum that will convince non-rum fans that rum is a versatile spirit. I weighted my opinion from 7 to 8 because I know that I'm not a sherry fan, but this is a damn good rum and I hate to weight it downwards with a 7. I'm a sucker for Barbados rum. I am an even BIGGER sucker for tasty Barbados rum. Doorly's XO is exactly that. Glad I finally got a bottle. Another product from the folks at R.L. Seale & Company so you know you are getting some of the finest in quality when it comes to rum. No additives. No sugars. The color is a rich, deep amber and the aroma is delightful. As usual I am unable to determine specific subtleties in the aroma but can only tell you that it smells great. No astringency. The flavor is fantastic. An initial sweetness indicating molasses and a nice vanilla/toffee undertone which then is joined in by that oak mentioned early. Here's where is gets interesting for me. With many rums aged in oak a noticeable bitterness from the oak tannins is present and often tends to overtake the flavor. HOWEVER with this rum, the oak flavor joins and blends with the initial flavors and never actually overwhelms. It is noticeable but is beautifully balanced. It rapidly fades revealing a delicious finish consisting mostly of the natural molasses. This is a rum that could be considered a sipping rum by many. Some would disagree. It makes an out-freakin'-standing mixing rum no matter how you cut it...or mix it. I cannot think of any beverage that would not benefit from Doorly's XO. Now one would think that for such a fine rum a bottle would cost $45-$50 USD? This is one of those rums that you get the most bang for your buck. The flavor is worthy of a $50 price tag but R.L. Seale and Company chose to charge much less. That alone is worth a couple of ratings points from me. I continue to grow more and more impressed with R.L. Seale & Company. This is a great rum. Ultimately on taste alone, I rate it a seven but it's $15 or so a bottle....FIFTEEN measly dollars for something this good(! ), I should give it a 9. Tasting notes: Don't be a stiff, just buy some and enjoy what I wager is the best value in spirits, period. Could sell for 2-2.5x the price with a fancier bottle and publicity, easily. A modern classic. Whisky-ish taste was supplementary for sipping it. I really like the Seale rums having tried Doorly’s 8 and RL Seale. I thought I’d try something new from Seale. I agree with many other reviewers that the sherry taste (with hints of black spice) takes away from a good aged rum. The price was excellent and if you like a quality slightly flavored rum, go for it. Harsh for the throat. Little bit dissapointed. With some ice it is ok. Aftertaste is good. Bought this bottle in a sale and was definitely pleased, good value for money and a nice distinct taste. Can be enjoyed as a sipper, but if your used to more aged rums at this price you can happily mix it. Found this one on sale during a monthly special at total wine. Perhaps even more smooth than the 12-year-old, this XO is remarkable for its texture if just a bit shy on the extra flavor notes found in its older sibling. This rum works well in cocktails or with coke. At this price it's worth owning to use in such drinks. Not sure where the previous reviewer paid $25-30 for this but I got two bottles at Total Wine in Florida for $15 each. RL seales is known for advocating purity in rum and as such doesn't sweeten or doctor his rums in any way, so might not appeal to some who are used to sweetened rums such as Diplomatico, Zaya or Zacapa,, but this is rum as it should be. Smooth Barbados taste. Sweet nose, vanilla, banana. Spicy notes in taste, not very long on tongue. Feels natural. Absolutely drinkable on its own. Havent tried in coctails yet. When you compare it to Plantation Barbados edition rums, then you will notice that Doorly’s is not sweet at all while Plantations are overly sugared and the vanilla and caramel make your stomach sick. This little rascal is finished in oloroso casks and the sherry is very evident on the nose right away along with a hint of banana and caramel. It’s a little dry. Sipping reveals a light and fairly elegant rum with subtle natural sweetness that quickly rolls towards a slightly tannic finish hinting at the sherry notes and perhaps a bit of coconut? I actually had a hard time defining the notes in this one. I prefer the doorlys 12 year but this Is still very nice and well balanced but perhaps a bit shy. Bajan rum full of luscious fruit flavors (red-fruits and stone-fruits). Velvety mouthfeel, quite rich (but not sweet). Good oak and vanilla, classic toasted/caramelized sugar flavors, and some pot-still weight too. A very skillfully crafted rum. Versatile enough for both mixing and enjoying neat. For $20, its an absolute steal. Make no mistake this is a nice rum. However with the exclusive "XO" label it left me wanting a little more (Personally next time I will go back to the 12yr old). As a sipping rum I did not find it quite smooth enough and much preferred the complex flavor when mixed (Ginger Ale). A great looking bottle worth having in your liquor cabinet if only to show the wide difference that can be achieved by master rum makers. Tried the Doorly's XO, 8y and 5y back-to-back and I have to say I went from bad to worse. The XO has a harsh alcohol smell, mish-mash of flavors on the tongue and a nasty burn to finish the experience. There are literally hundreds of much better aged rums in this price range, so don't waste your money on a Doorly's. 1st impression no so dry not so sweet , finish is dry. To my tastes, this is a very good rum without being quite top notch, which makes it a great rum to bounce others off of. It reminded me of the Plantation 5 year old Barbados in some ways. It has a similar smell and first taste. However, the Plantation is sweeter (it does have sugar and caramel additives) and this is a bit more sherry and alcohol tasting. It's still pretty smooth and a really good sipper. If you like one, you are unlikely to hate the other and so it depends whether you like slightly sweeter or not - or perhaps you'll have both, as I do, for alternatives. Velmi průměrný rum za velmi průměrnou cenu. Na Barbados chabé. Nikdy více.